Built for serving a very important purpose of the defense of Amber, Nahargarh Fort was constructed by Sawai Raja Jai Singh in the year 1734. It is also called the 'Tiger Fort'. Several new structures were added to the fort in the 19th century which contributed to its charm. The additions were made by Ram Singh II and Sawai Madho Singh II. The fort used to serve as a picnic ground for the royal family. 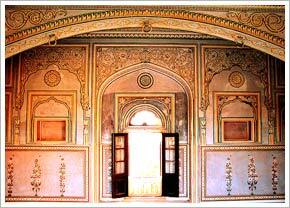 The local people of Jaipur say that once this fort was an abode of the spirit of a prince named Nahar. Every time some construction was done the spirit would demolish it. The spirit would not let the construction of the fort proceed. Finally a tantrik was called who performed puja and chanted some mantras and as a result the spirit agreed to leave the place. However, before leaving the spirit demanded that the fort should be named after him. Hence the fort is called Nahargarh. Several buildings lie inside the boundary of the fort and Madhavendra Bhawan is the most impressive amongst all. It was built by Sawai Ram Singh II. The beautiful rooms of the building are interconnected with attractive corridors. Nahargarh fort overlooks Man Sagar Lake which is very charming. On your tour to the pink city Jaipur you must visit Nahargarh Fort which is a symbol of royalty of the Maharajas of the yesteryears.